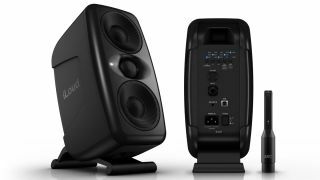 NAMM 2019: Flushed with the success of its iLoud Micro Monitor, IK Multimedia is preparing a bigger speaker in the form of the iLoud MTM. Larger than its Micro sibling, but still compact, this promises nothing less than to “reinvent nearfield monitoring for professional and home studios”. IK’s big claim is that the MTM offers both ultra-flat frequency response and truly linear phase response. This comes as a result of some clever DSP processing, which also facilitates digital crossovers and self-calibration that’s derived from IK’s ARC System. In fact, you get the company’s ARC microphone in the box: set up your monitors, position the mic in the desired listening position, press a button and you’ll get instant calibration for your specific listening environment. The end result, we’re assured, is great accuracy, clarity and transparency. You get 100W RMS power and frequency response of 40Hz to 24kHz, while the symmetrical MTM design promises enhanced imaging and the sweetest of sweet spots. The two 3.5-inch woofers and 1-inch tweeter are designed to deliver a more natural sound and reduce ear fatigue, meaning that you can mix for longer. Thanks to the adjustable tilting mount, you can configure the iLoud MTM perfectly in a wide range of setups, and the speakers can be positioned on a stand, a desk or a shelf. In short, IK is saying that the iLoud MTM can give you the accuracy and bass response of a larger monitor, but in a compact design that makes it perfect for use at close distances. It’ll be released in the second quarter of 2019 for $350/€350 (each). Find out more on the IK Multimedia website.